Maybe because lately I’ve been up to my elbows in peaches and tomatoes, thanks to our current class themes. Or perhaps the sudden glut of zucchini — from generous neighbor gardeners in the wake of an attack on my own garden by a band of groundhogs (as of yesterday’s death count, two down, one to go). I had in my head to make soups — several of them. That lead to a need for chicken broth home made is so worth the effort. So I brought home a Bart & Sarah’s chicken from the Saturday Warrenton Farmers Market and if you ever are out this way on a Saturday morning or in God-help-you Ballston on a Thursday afternoon, Sarah will happily furnish you with one of her delectable birds. They are worth the trip and this is no lie. A really good chicken broth must start with a whole chicken. 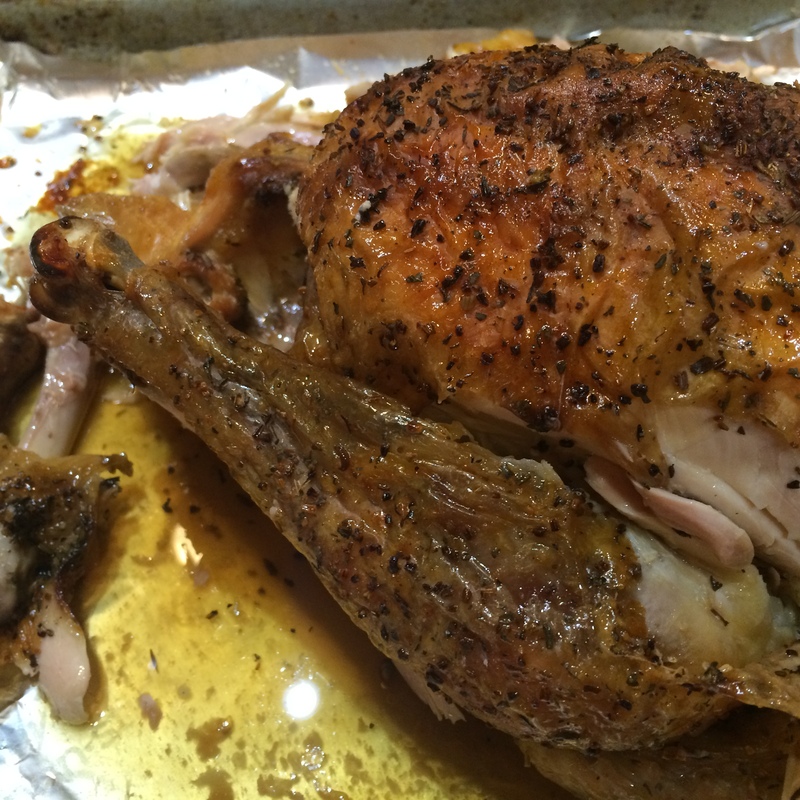 I patted the bird dry inside and out with paper towel, dropped her/him into a plastic bag and added a mixture of equal parts fennel seed, herbes de Provence and coarse salt, which I had ground a bit in the grinder (formerly a coffee grinder). I bounced the chicken about to get the spices evenly distributed over and inside. Let it sit at room temperature, which today, btw, hasn’t been too bad, maybe 78? After an hour or more passed, I trundled the bird out of the bag and onto an oven pan lined with non-stick aluminum, one of mankind’s greatest inventions, right after fire. Into a 425 oven. Another hour or so, during which I went about doing garden chores mostly trying to repair the damage of five weeks while we strolled beaches in Rhode Island in June (hence the platoon of groundhogs moving in). When I came back in to the aromaI knew I had something special. Credit goes squarely to Bart and Sarah — this chicken was so reminiscent of my childhood in France, the transporting poulet roti that was served up regularly in our home, made as often by our mother as by what cook might have been working alongside her at any given time. The flavor rich and complex, with the tang of salt, the intensity of the dried herbs and spices. So simple, so pure. Now I have the bones simmering in the Le Crueset on top of the stove. I’ll get to that soup yet. By way of Jody Williams, chef of Buvette in NYC. Combine herbs in a grinder or mortar and pestle; process just to break up the salt and fennel a bit, one or two seconds. Place chicken in a large plastic bag. Add spices and toss chicken to coat well. Let the bird sit at room temperature for an hour or in the refrigerator up to three days. When ready to cook, heat oven to 425. Place bird in an oven pan. Cook in the oven one hour. Turn off the oven and let it sit until inside temperature reaches 165, or for another 15 minutes. 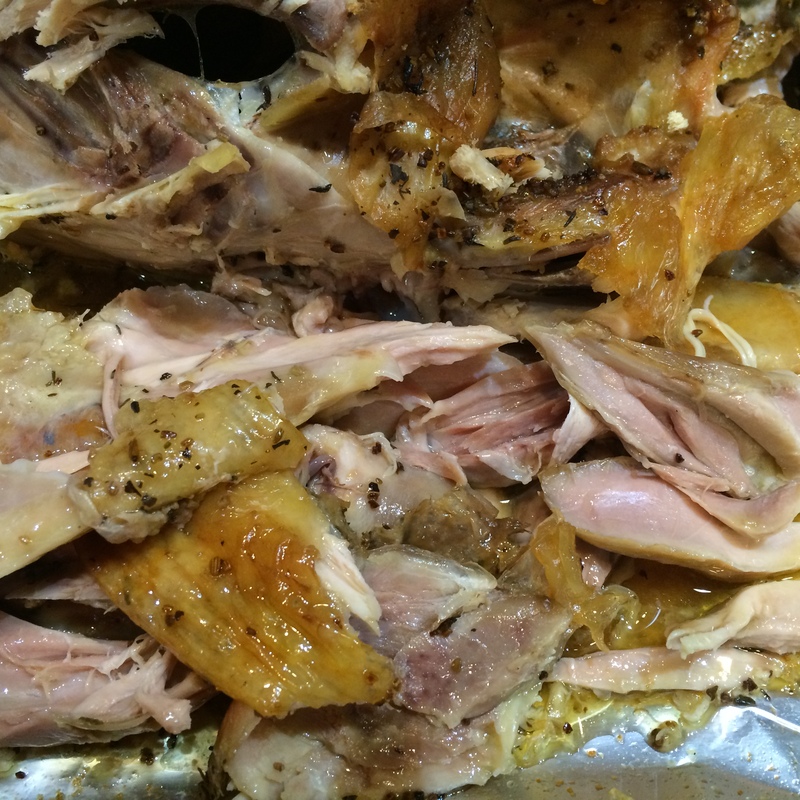 Remove from oven and let sit, covered, 15 minutes before cutting into chicken. This entry was posted in Main Courses, Recipes from Adrienne's pantry and tagged chicken, chicken broth. Bookmark the permalink.